Preacher and leader of one of the so-called people’s expeditions during the First Crusade (1096-1099). He was also known as Peter of Amiens, having been born in or near that city in northern France. Peter the Hermit is one of the most problematic individuals associated with the entire crusade movement. The contemporary sources for the First Crusade are unanimous in presenting him as the leader of one of the armies of the crusade. The “French” chroniclers, notably Fulcher of Chartres, Peter Tudebode, Raymond of Aguilers, and the anonymous author of the Gesta Francorum, report nothing of his activities until his arrival at Constantinople (mod. Istanbul, Turkey). There, according to the Anonymous and Tudebode, his undisciplined troops carried out acts of violence until Alexios I Komnenos, the Byzantine emperor, had them ferried across the Bosporus to Asia Minor. There, they allegedly continued their wrongdoings and, under the inadequate command of Peter, who lacked authority, strayed too far into Turkish territory and were slaughtered at Kibotos (22 October 1096). The emperor, not sorry to be rid of them, rescued the survivors (among them Peter) and had them disarmed. For many historians, both medieval and modern, Peter’s subsequent role in the crusade was a minor one. All the sources, however, agree that Peter later acted as ambassador of the entire crusade armies to the Turkish emir Karbughā, while they were being besieged by him at Antioch (mod. Antakya, Turkey) in June 1098. They were starving and had lost most of their horses, but were comforted by the discovery of the Holy Lance that had been predicted by visions. Their fate depended on Peter’s mission: his aim was to obtain either the conversion of Karbughā or a single combat, their only plausible chances of salvation. Yet according to some of the “French” sources, Peter had previously tried to desert from the army along with William the Carpenter (January 1098). One can only wonder that the mission to Karbughā should have been entrusted to Peter, who was discredited by his incompetence and his ignominious flight. Karbughā refused the crusaders’ demands, and the ensuing battle was won by the crusaders, miraculously assisted, it was claimed, by celestial warriors (28 June 1098). According to Raymond of Aguilers, Peter was also chosen to receive and distribute the tithes that the crusade leaders arranged for the relief of the poor within the army. Finally, most sources highlight Peter’s important role in Jerusalem after the capture of the city (15 July 1099). While the majority of the crusaders left Jerusalem in order to intercept a Fāţimid relieving army from Egypt, which they defeated at Ascalon (mod. Tel Ashqelon, Israel) on 12 August 1099, the leaders gave Peter the responsibility of organizing, among the Latin and Greek clergy in Jerusalem, the processions and propitiatory prayers that they hoped would bring them victory. Peter was thus evidently assigned the biblical role of Moses, who prayed to God while Joshua fought against the Amalekites. These indubitable facts call for a reexamination of those accounts that are more favorable and more detailed with respect to Peter, particularly that of Albert of Aachen, once neglected but now rehabilitated as a source of the first order. According to Albert, while undertaking a pilgrimage to Jerusalem, Peter had experienced a vision of Christ asking him to preach in favor of an expedition to rescue the Christians in the East and to liberate the Holy Sepulchre. Peter is said to have received a letter from the patriarch of Jerusalem confirming this calling, and, upon his return, to have informed the pope of his divinely ordained mission before going to preach in Berry and the Amiénois, as well as the Moselle and Rhine regions, exhibiting letters that had supposedly fallen from the sky, in an atmosphere of wonder and exaltation. 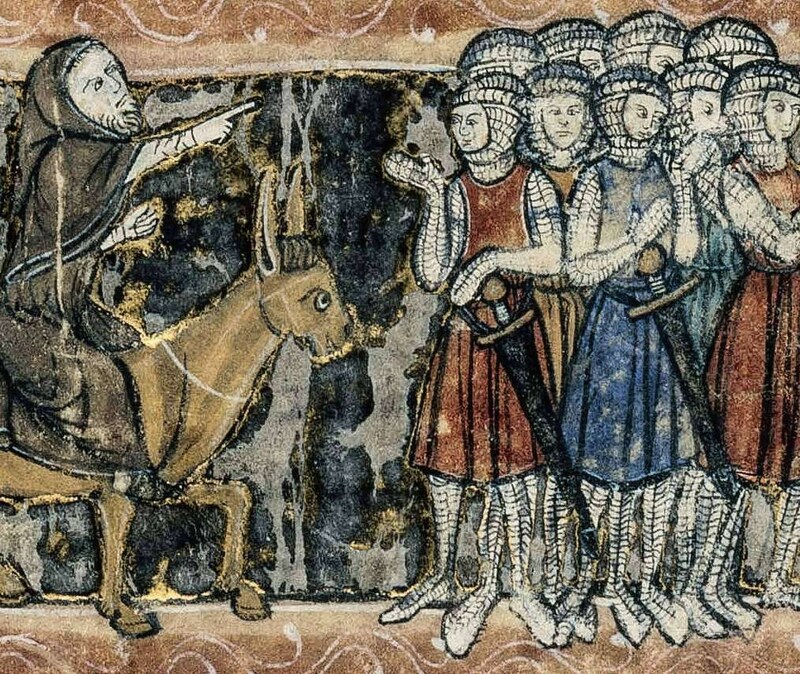 The chronicler Guibert of Nogent, who actually met Peter, gives a description of him that highlights his charisma and his great popularity: the crowd saw him as a quasi-divine character and venerated him so much that they even pulled hairs from his mule to use as relics. The Jewish sources confirm his power over crowds as well as his use of letters: Peter indeed possessed a letter from the French Jews “advising” other Jewish communities to provide him with the financial help he asked for. According to several German sources, he assembled 15,000 men, and soon found fanatical emulators: the priests Volkmar and Gottschalk and Count Emicho of Flonheim each assembled forces of several thousand men. These forces, especially those of Emicho, carried out terrible pogroms among the Jewish communities of the Rhineland and also of Prague; these occurred for reasons of cupidity, because of the identification of Jews with Muslims as “enemies of Christ,” and also because of a desire to fulfill, by force if necessary, a prophetic tradition that announced the conversion of Jews at the end of time. Emicho indeed evidently styled himself as the king of the last days who was to unite the Greek and Latin churches and present Christ with his crown at the Mount of Olives. These troops were finally dispersed during their passage through Hungary and Bulgaria by the armies of local rulers. The expedition led by Peter the Hermit, which preceded the others, does not seem to have taken part in these pogroms. In March 1096, Peter and his army marched along the Rhine and the Danube, without any incident other than a skirmish in Semlin. They arrived at Constantinople on 1 August. Emperor Alexios I allowed them to camp outside the city walls, received Peter cordially the next day, and gave him money in recompense for the treasury that had been seized by the Byzantine governor at Niš Alexios had them transported over the Bosporus to the Asian shore; there they were meant to await the arrival of the main crusade armies, which were due to depart from their homes on 15 August. The emperor promised to provide them with fresh supplies and recommended that they not stray too far from the coast. According to Albert of Aachen, Peter was in Constantinople negotiating for supplies when some reckless crusaders brought about the slaughter of his troops by going against the orders of his second-in-command. It thus seems that neither Peter not the emperor bore the responsibility for this disaster. Neither Albert nor Anna Komnene, the daughter of Alexios, states that Peter’s troops carried out any plundering in Constantinople, although they emphasize the damage caused by those of Godfrey of Bouillon. Anna sees Peter as the real initiator of the First Crusade; according to her, he preached it so that he might complete a previous, unfinished pilgrimage. These sources thus present Peter as a charismatic individual invested with a mission that he claimed he had received directly from Christ. The subversive dimension of his character, his independence from the pope, the slaughter of his troops (sometimes regarded as a divine judgment), and his agreement with the Byzantine emperor probably led some chroniclers to minimize the part he played in the crusade. The Gesta Francorum certainly does so, and most of the “French” sources follow this account. However, this source was written when Prince Bohemund I of Antioch, the master of the anonymous chronicler, went to France with the aim of securing help against Emperor Alexios, his enemy (1105-1106). The author evidently sought to discredit the emperor and those favorable to him, including Peter. This motive could well explain the report of his alleged flight from Antioch. It is mentioned by seven sources: the Gesta Francorum, Peter Tudebode, Robert of Rheims, Guibert of Nogent, Baldric of Bourgueil, Orderic Vitalis, and the Historia Belli Sacri; however, all of these are dependent on the anonymous author of the Gesta Francorum, with the (possible) exception of Tudebode. Conversely, Peter’s desertion is not mentioned by seven independent chroniclers (Fulcher of Chartres, Raymond of Aguilers, Albert of Aachen, Radulph of Caen, Gilo of Paris, Ekkehard of Aura, and William of Tyre) or in any of the surviving letters sent by participants of the crusade. Moreover, according to the Gesta Francorum, the two deserters at Antioch were brought back to the camp by Tancred, Bohemund’s nephew; yet Radulph of Caen, a source close to Tancred, names the deserters as William the Carpenter and Guy the Red. In 1105 Guy was an important personage: he was seneschal of France and was endeavoring to marry his daughter to the king of France, a marriage that did indeed take place before being annulled by the Council of Troyes (1107). It would be understandable that the author of the Gesta Francorum would choose to replace the name of such an important person with that of the humble hermit Peter. By this stage in the crusade, Peter’s prestige had been largely lost. Whether this was a result of the disillusion caused by disappointed eschatological hopes is not known. It is even uncertain what became of Peter after the conclusion of the crusade. There was a tradition, based on a few much debated documents, that on his return he founded a church at the monastery of Neufmoutier in Huy. This was supposedly where he died (perhaps around 1113) and was buried. Later legends that depict him as a nobleman, an erudite knight, and tutor to the Flemish princes are based on obvious forgeries. Bibliography Blake, Ernest O., and Colin Morris, “A Hermit goes to War: Peter the Hermit and the Origins of the First Crusade,” Studies in Church History 22 (1985), 79-107. Coupe, Malcolm D., “Peter the Hermit, a Reassessment,” Nottingham Medieval Studies 31 (1987), 37-45. Flori, Jean, “Faut-il réhabiliter Pierre l’Ermite?,” Cahiers de Civilisation Médiévale 38 (1995), 35-54. —, Pierre l’ermite et la premiere croisade (Paris: Fayard, 1999). Hagenmeyer, Heinrich, Peter der Eremite (Leipzig: Harrassowitz, 1879). —, Le vrai et le faux sur Pierre l’ermite (Paris: Société Bibliographique, 1883). Morris, Colin, “Peter the Hermit and the Chroniclers,” in The First Crusade: Origins and Impact, ed. Jonathan Phillips (Manchester, UK: Manchester University Press, 1997), pp. 21-34. Wallenborn, Hélene, “Pierre l’ermite aux origines du Neufmoutier?,” Annales du Cercle Hutois des Sciences et Beaux Arts 48 (1994), 221-239. This entry was posted in Biography, Crusades by MSW. Bookmark the permalink. Thank You very much for all the work you did for this very interesting article.